With warmer weather just around the corner it’s time to start thinking about your roof again. With warmer weather also comes storms and higher winds which can damage the roof on your home. Being aware of damages that can occur on your home’s roof can help you prevent further damage from occurring on the interior of your home which can cost much more. I’ve included 5 signs that you should look for on your home’s roof to determine if you may need roof repair in South Lyon Michigan. If you find any of the following problems on your roof be sure to call Livingston Roof Pros to get a roof inspection on your home. When your home’s roof has a problem it usually occurs during a storm or higher winds. So whenever there is larger storms that come through the South Lyon Michigan area it’s best to give your home a quick look to see if any of these problems exist. Of course, all of these items can be seen or determined from the ground level. We do not recommend going on your home’s roof. It is very dangerous and you can be seriously injured or even killed by falling from the roof. If you suspect there is a problem on your home’s roof and you need a closer look be sure to use binoculars or a drone to get a better look. You can also call Livingston Roof Pros to come out and do a roof inspection if you’re not sure. When the roof on your home starts leaking the water will make it’s way into your attic and then saturate the insulation in your ceilings. The water will then start to seep into the drywall on your ceilings. Once this happens the drywall will turn a brownish tint and will be moist to the touch. If found early, sometimes the drywall doesn’t need to be replaced only primed and painted again. However, if the drywall continues to take on water it will need to be replaced. If you notice a brownish stain on your ceiling, no matter how small, make sure you get it checked for a roof leak. Storms can damage the roof on your home. In particular the biggest problem with storms is the winds that can affect the roof during a storm. The rain may be the reason the interior of your home is damaged but typically the roof is damaged by winds which blow shingles and break them from the roof. Give your roof a good look to determine if there are any missing shingles. Many times the areas where shingles are broken from the roof will be really dark and very prominent on the roof. If you notice any of these spots on the roof be sure to get a roof inspection on your home. Sometimes when winds break shingles from the roof they don’t always end up staying on the roof. Many times the bits and pieces of shingles will fall into the gutters on the home and sometimes on the ground around the home. If you notice these bits and pieces of shingles around your home be sure to get a roof inspection and look for areas of the roof that have missing shingles as well. Most shingles are designed to last for 15 years. While there are some roofing shingles that are designed to last much longer, 15 years is really common. Once the shingles get older they begin to start curling at the edges. This can be really bad because it allows more wind to impact the shingle and the shingle loses it’s adhesion to the lower lever shingles. Although having debris on the roof may not result in a roof leak initially, it will deteriorate shingles prematurely. This allows the shingles to be damaged which may result in a roof leak. Debris can be leaves from trees or even branches. You’ll also want to look for areas on the roof that moss is growing as this also can be a problem. If you have any of these problems on your home’s roof it’s important to get a roof inspection done to determine the condition of your home’s roof. 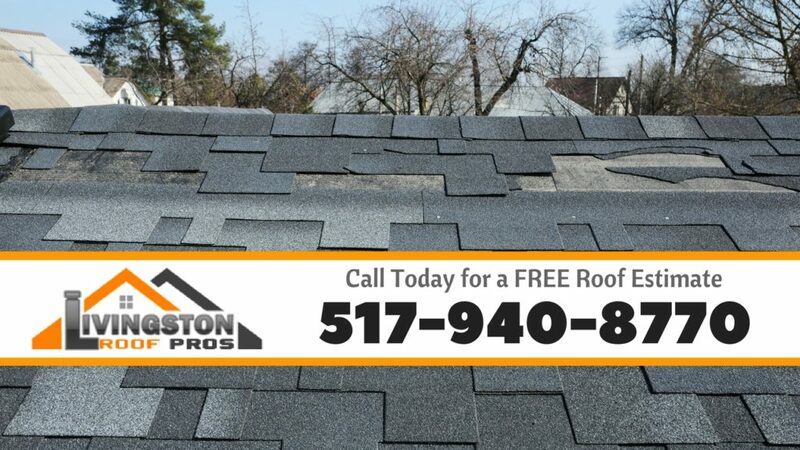 Call Livingston Roof Pros today for a roof inspection in South Lyon Michigan.